Rare gold coins offer the advantage of increased profit potential over gold bullion coins and bars due to their quality and scarcity. Whereas literally millions of new gold bullion coins and bars are minted and manufactured each year, no one is making any new rare coins! The most common rare gold coins have surviving populations in the thousands, as opposed to the tens of millions of gold bullion coins which exist on the market. Rare gold coins also offer enhanced protection against government restrictions on private gold ownership. In 1933, the President put forth an executive order to confiscate privately owned gold and outlaw the private ownership of gold. However, the order specifically exempted numismatic rare coins from confiscation. Many who value their privacy also acquire US rare coins due to their status as a collectible that allows purchase and sale of them without 1099-B reporting to the IRS by the coin broker/dealer. These transactions are confidential. The chart below shows an equal $1,000 applied in 1970 into the three asset categories shown. Since then Mint State Numismatic Rare Gold Coins have outperformed the DJIA close to 5 to 1 and gold bullion close to 3 to 1. From 1795 to 1933 the U.S. minted gold coins for use in commerce, both within our borders and with overseas trading partners. That legacy came to an abrupt halt in 1933 when President Franklin D. Roosevelt ordered a halt to the minting of gold coins and issued an executive order confiscating privately held gold and making it illegal for Americans to own gold. The relatively small number of survivors (less than 3% of the original mintages have been graded by PCGS & NGC), range in age from 76 to 214 years old and have significant appeal to investors and collectors alike. In fact, according to statistics published by Professional Coin Grading Service (PCGS) and the Penn State Department of Economics, rare gold coins in many instances, have historically outperformed gold bullion by a wide margin. 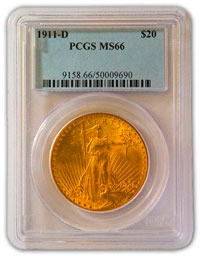 At ITM Trading, we believe that $20 Double Eagle gold pieces minted from 1849 to 1933 should form the foundation of your tangible asset holdings. These coins were minted in two primary types: the Liberty $20 Double Eagle (1849-1907) and the Saint-Gaudens $20 Double Eagle (1907-1933). These coins are among the most gold-rich, affordable, liquid, popular, historically significant and attractive issues on the rare coin market. Rare coins have produced exceptional long-term performance for their owners. This track record stems from the basic fundamental factors which drive the rare coin market. Nobody is minting any more rare coins. In fact, the last rare gold coin emerged from the mint in 1933. As a result, supplies of rare coins are constantly and inevitably diminishing as coins are taken off the market for inclusion in closely-held family collections and long-term portfolios. Demand, on the other hand, has been on an upward trajectory for many years. This simple set of circumstances explains why rare coins increase in value over the long haul. Many Americans who value their privacy also acquire U.S. rare coins due to their status as a collectible that allows purchase and sale of them without 1099-B reporting to the IRS by the coin broker/dealer. In fact, no reporting forms are required during any part of the transaction. These transactions are confidential and virtually paperless. In today’s litigation-happy atmosphere and instantaneous transmission of personal data of all sorts via the World Wide Web, it is comforting to know that rare coins afford their owners an unsurpassed level of true privacy with which to protect their wealth. During the last gold confiscation in 1933 under Franklin D. Roosevelt, gold bullion was confiscated by the federal government but rare coins were not. As collectibles, rare gold coins do not fall within the provisions allowing confiscation and in fact are specifically exempted by language in the executive order (click here to read the executive order). Many experts believe that future confiscation of gold bullion is a likely possibility, and that rare or numismatic coins will be again excluded. Many financial experts advise that portfolios contain 10% to 20% in tangible assets to maintain effective diversification. Because rare coins do not typically move in the same direction as traditional paper assets, they can play a useful role in virtually every investment portfolio. Successful diversification can only be achieved if a portfolio includes a combination of holdings that do not typically move in the same direction at the same time. Rare gold coins are not positively correlated over the long-term to paper assets, such as stocks, bonds and the US dollar. This makes them an effective diversifying element to include in your overall financial plan. PCGS- and NGC-certified coins are among the most liquid collectibles of any type in the entire world because they trade sight-unseen between dealers worldwide on a daily basis. Coins of varying levels of scarcity trade electronically on an exchange that functions much like the NASDAQ. Moreover, literally thousands of coin dealers from coast to coast buy and sell coins each and every day, so there is a ready, physical, face-to-face market in place to provide owners of rare coins a means by which they can sell or trade their coins in every major city and town in America. In addition, hundreds of millions of dollars worth of coins and other numismatic items change hands year-round at numerous coin shows on a circuit that reaches just about every corner of our nation at some point during the course of the year. Rare gold coins provide the added benefit of intrinsic value. While stock certificates and debentures have historically, from time to time, been rendered worthless, rare gold coins can never fall to zero because they will always be worth at least as much as the value of the gold that they contain. Rare coins can be the perfect vehicle to concentrate a great deal of wealth into diminutive dimensions. With rare coins, you can readily put hundreds of thousands of dollars of value in a package smaller than the average paperback book! This feature of rare coins makes it possible for coin owners to move their wealth without unwanted attention. In this regard, rare coins compare very favorably to other collectible investments, from classic cars to sculptures and paintings, none of which is as portable as rare coins. As compared to many categories of investments, such as real estate, as well as certain other collectibles, rare coins are generally within the financial wherewithal of most Americans. While there have been instances in which rare coins have sold for seven figures, attractive and promising collections and portfolios can still realistically be begun with less than five thousand dollars. Rare coins offer one last benefit that most other asset categories cannot match: collector value due to their artistic appeal and historical importance. This is important even for those coin owners who do not personally wish to become collectors simply because it is this collector value that attracts many buyers to take coins off the market to be held in collections with no intent to liquidate. To learn more about what rare gold coins can do for you, contact an ITM Trading representative at 888-OWN-GOLD (888-696-4653). 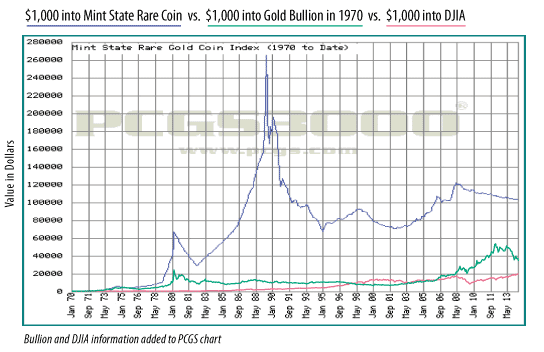 * this average is calculated using the pcgs.com chart entitled “Mint State Rare Gold Coin Index” and is compared against a bullion start price of $35oz in 1971. Prior to 1986, coins were usually graded by dealers. This obvious conflict of interest created controversy over the grade and value of the coin. In 1986 and 1987, two nationally recognized independent third party grading services, Professional Coin Grading Service (PCGS) and the Numismatic Guarantee Corporation (NGC), adopted the Sheldon Scale to grade coins. The Sheldon Scale was developed in 1948 by Dr. William Sheldon, a renowned numismatist, who assigned a grade of 1 to 70 to each coin being evaluated. Using the Sheldon Scale these two organizations independently grade each and every coin submitted to their service, eliminating any conflict of interest. Uncirculated grades are Mint State (MS), beginning at MS60, and rising to MS70. Each step in the grading process reflects an improvement in quality. Since the inception of PCGS and NGC, the condition of individual coins has been greatly emphasized. The advent of these services means you can acquire gold and other rare coins with confidence, knowing that the coins are authentic and properly graded. In fact, today valuable and rare coins are routinely sold sight-unseen via the telephone or electronic numismatic exchange. However, ITM only sells sight-seen coins, and we believe it is wise for an investor and/or collector to understand the difference. There can be quite a variance in the price one might expect to pay and, more importantly, the price one might expect to receive between sight-seen and sight-unseen coins, especially when the coins are sold! The paragraphs below are taken verbatim from the May 10, 1996 Certified Coin Dealer Newsletter (Bluesheet). This is a dealer-to-dealer newsletter which indicates the wholesale value of sight-unseen coins. We think it may help you better understand why ITM Trading only offers sight-seen coins to its clients. If you have any questions, especially on how to own rare gold coins, please call your ITM representative today! While the Bluesheet represents sight-unseen Bidding activity, it is terribly unfair to assume that all the information within these pages comes from the method of trading. When generic coins trade daily, sometimes hourly, such as MS65 Morgan Dollars, one could rightfully assume that the prices paid are truly representative of the wholesale market; whether it be sight-seen or sight-unseen. If Bid is $90 and hundreds of coins trade at $90, give or take a dollar, it sounds like MS65 common Morgan Dollars are worth $90 wholesale. When coins are not generic, they do not trade on a daily, weekly, or even a monthly basis. They trade when a buyer and seller get together. This will usually take place when one dealer (the buyer) likes the coin better than the other dealer (the seller); the coin is then added to the buyer’s inventory. Or, the buyer has a customer for this particular coin. Of course, the customer (collector) then buys the coin sight-seen from the dealer. While this sort of activity takes place every day, the same coins (denomination, date, and grade) are not traded that often. Despite the popular belief that sight-unseen Bids may represent value, this is not the case at all. We may see three sight-unseen Bids for a particular Type coin at $1,400, $1,410, and $1,420; yet, the sight-seen Bids may be something in the area of $1,750, $1,800, $1,900, and $2,000. One ugly coin might trade sight-unseen at $1,420, but this coin will usually not be sold to a retail customer. This is what may be accepted when a seller needs money. At the same time, several coins may wholesale at the $1,750 to $2,000 level and then be sold to retail customers. These would be nice coins that collectors would be proud to own. At the same time, these should be coins that the dealer will want to buy back at a later date. The point here is that the sight-unseen Bids are a safety-value price; they do not represent value (except for generics). They represent quick-sale wholesale levels. When one wants to sell nice coins, they will command sight-seen prices to the buyers that appreciate them the most. Video: PCGS’s grading process with David Hall, President and Founder of PCGS.